Think back to your first experiences with a pocket knife. If you are anything like me, it probably came in the course of exploring your father or grandfather’s desk drawers or perhaps rifling through that treasure box of items many men keep. Invariably, you would come across at least one well-worn red handled Swiss army knife (SAK). For many that would be their first encounter with a pocket knife. And for many more, their first practical experiences with a pocket knife may very well have have been at boy scouts. I vaguely recall my first pocket knife while camping as part of my tenure at scouts. I am unsure on the exact model number, but it was some sort of a classic SAK. I would use it to prepare tinder for a fire, get ingredients ready for the dutch oven, and even used it to try my hand at carving one of those wood handkerchief slides. These were some of my first experiences with pocket knives. When I pause to reflect on those moments I am instantly transported back in to a much more simple and wholesome time of my life, with much of it centering around the ubiquitous Swiss army knife. Fast forward to me starting to seriously get into the hobby of knives. My first “real” knife was a Benchmade Griptilian. From there I then ran fast and hard down the rabbit hole. I have handled many many pocket knives. Hell I have reviewed over a hundred here on this website alone. In my search for a perfect pocket knife I have spent thousands of dollars. At this point I don’t think twice about spending several hundred dollars on a single knife if it catches my eye. I’ve traveled to Blade show, joined a knife collecting club, appeared on podcasts, videos, and guest blog posts all to advance my interests in the latest and greatest portable cutlery. But my knife collecting came full circle when a little over a year ago I was given the gift of a Victorinox Cadet. Mine was the very same unassuming blade that I would find in my father’s dresser drawer. Red plastic handles. Unassuming blade complete with the usual cap lifter and can opener. Instinctively, upon unboxing this new blade and admiring the snappy action of all the little tools I put the Victorinox into my pocket. It has been over a year later, and I haven’t left the house without some sort of a SAK since. For many I am surely preaching to the choir. This is after all, the quintessential pocket knife. An unwavering staple in the every day carry of men the world over. I still want to pay my respects, write this review, and share with you a tool that I hold quite near and dear; the humble Victorinox Alox Cadet. The Alox Cadet has an overall length of 5.75″, a 2.5″ blade, and weighs 1.6 ounces. Victorinox makes the Cadet in a number of variations, I happen to like the one with the silver aluminum “alox” handles because it keeps the knife nice and thin and seems to wear a little better than its plastic-scaled counter parts. It’s also worth noting that Victorinox makes larger and smaller knives with the Alox handles as well. Ones that quickly come to mind include the Pioneer (larger) and Classic (smaller). The Cadet is the perfect size for daily carry. Mine rolls around loose in the bottom of my pocket every day. At a sub $25 price point, I could care less if it gets beat up by my flashlight and car keys. Even if by some freak accident the knife it were to fall out my pocket some day I would have no problem plunking down the coin for another one. When I am at work this is the only knife I carry. I spend most of my day behind a desk banging away at a keyboard or talking on the phone, so this little slip joint is plenty of knife for the things I do, which is mostly opening letters and packages. At home the Cadet can often be found cutting up apples, smearing cheese onto crackers, or handling whatever other minor task I may have at hand. The thinly ground blade of the Cadet slices as good or better than anything else I have handled. Seriously, it’s a little laser and it cuts really well. Whatever stainless steel Victorinox uses sharpens very easily and doesn’t stain. This is a softer steel so it doesn’t earn a blue ribbon for edge retention, but it holds a decent edge and a couple licks on a strop will restore it to hair shaving performance at the end of the day. I’d say it’s on part with 8Cr13MoV and other lower end steels. The only other maintenance I perform is regularly washing the knife out with hot soapy water. When I’m not at work I may clip a larger folder to my pocket, but the Cadet still comes in handy as a secondary blade. It’s perfect for situations where you don’t want to bust out a large knife, and the extra tools are real handy too. Victorinox includes a nail file / phillips driver, a can opener, and a bottle opener/flat head driver. Next to the blade my bottle opener sees the greatest amount of use, but the drivers can come in handy and the file can maintain your fingernails in a pinch. In a sub 2-ounce package you won’t find much else that packs as much utility as the Cadet. Handle construction of the Cadet is simple, but everything is clean and nicely finished. The knife is pinned together. The tools and backspacer are given a high satin finish while the aluminum handles are given a matte finish. After a year of daily carry and use my Cadet does show some signs of wear, but it is still a handsome knife. The action for all the tools is still springy and satisfying and there is no play with any of the parts. A discussion of the “ergonomics” of the Cadet is almost laughable, as I have never used the knife for tasks harder than breaking down a cardboard box, but the handle is big enough to get 4 fingers around and is plenty comfortable for my needs. The handle texture is pleasing to touch and visually interesting. It provides some traction without being obnoxious. The red Victorinox shield provides a splash of color and that extra touch of class. There is no pocket clip on the Cadet, which is just the way I like this knife. Unlike my $300 Strider PT, I have absolutely no reservations to pocket carrying the Cadet. It doesn’t need a little leather slip-sheath or anything like that, although Victorinox does include a split ring if you want to put a lanyard on it or attach it to your keys. It’s a beater knife and gets beaten up quite a bit in my pocket, but the slim design and durable aluminum scales allows the knife to age gracefully. What is left there to say about the Cadet? Buy one. Seriously, this is an absolute must have knife. Buy a couple and give them as gifts to family and friends. You won’t find a nicer knife for $20 and you won’t find anything as functional and disarming either. That said, despite the small price tag this is still a very classy knife and it comes with an unexpected level of pride of ownership. And it performs too. This thinly ground edge can’t be beat for managing your mail and cutting up food. And all the extra tools are gravy… delicious, delicious gravy ladled on top of one of the finest little EDC knives money can buy. If I had a gripe about the knife, it would be that I really like the little tweezers and toothpick included with the thicker plastic handled version of the knife, and sometimes miss that with the Alox Cadet. But there is a price to pay for style and durability, and the trade off is that Victorinox cant squeeze in those tools. At this point I have waxed poetic about EDC knives for the better part of 5 years. This is the gold standard for EDC. Whether it’s your primary knife or a secondary blade paired with a larger folder or fixed blade, the Cadet is sure to get lots of use and will be appreciated by seasoned knife collectors and laypeople alike. I don’t say this often, but the Cadet is a must have knife. 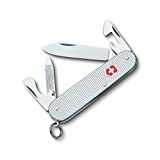 I recommend purchasing the Victorinox Cadet at Amazon or BladeHQ. Please keep in mind that purchasing anything through any of the links on this website helps support BladeReviews, and keeps the site going. As always, any and all support is greatly appreciated. Thank you very much. How did you know my first experience with a folding knife was while rummaging through the stuff in my father’s desk! If you have the Pioneer, is the blade the same as that on the Cadet? Are those the same as that on the Alox Solo, which has no tools other than the blade? The Alox models really are light-weight enough, small enough — and cool enough — to EDC just about anywhere. My pleasure, thanks for stopping by. I don’t have the Pioneer, but I think it has a bigger blade. No idea with the Solo. I’ve seen one, but can’t recall it well enough for a direct comparison. The Cadet was the first knife I owned. My Father bought it for me when I was ten while on vacation in Portland. Every boy and girl should have one of these. Until I started collecting folders, all I ever carried was a SAK, the Tinker model for the majority. Vic’s and Moras….. Best knives for the money on the planet. I can’t agree more, Russ. This one still finds its way into my pocket more days than not. And I’ve got a vast array nice knives at my disposal. With a split ring. I feel like it creates a really bad hotspot and won’t for onto a keychain anyways. Some people grind it off. It shouldn’t be too hard using a Dremel tool. Just so you know, the steel Victorinox uses is called 1.4116. My SAK has developed a fault where the pivots have become so gummed up that I can’t deploy any of the tools. Any suggestions to remedy this? Thank you, Adam. I will update the review accordingly. Much appreciated. Hey Dan, I was watching your Best EDC video on YouTube (great video btw), and I noticed that you had a Alox Cadet that appeared to be Red. Is this a custom job you did or does a red Alox Cadet exist? I think it looks amazing! I’ve carried this knife nearly every day for over ten years. Loved it in my pocket so much I purchased one in every available color with the aluminum handle to give out at my wedding as groomsmen gifts. I doneed consider it a beater; more like a companion, like my old Jeep and Border Collie. There may be better, but this one has always been there for me no matter what. Every day carry? Yes! Lifetime carry? Likely so. That’s about as strong of an endorsement as one can give! So glad to hear you have been enjoying your Cadet for over a decade. That’s awesome. Thanks for the great site. I have this knife, and to my surprise, I often leave my trusty Benchmade 940 at home, and feel perfectly fine carrying this little beauty. What a great little tool. Also a great gift for someone who is not a “knife guy” (or one who is). I have a gentlemans INOX very thin pocket knife that belonged to my father. I suspect that he get the three blade, knife blade, finger nail file, and scissor blades in the latter l930’s or l940’s. It has a lion on one side of the 3″ blade and the word INOX on the other. Each part had the INOX written on it. The handle is engraved metal and the thickness of it is totally about 1/16 if an inch thick and 4 inches long. Can you tell me something more about the gentleman’s knife? I am 78 years old and received it when my dad died in 1970.